The BeBop era is recreated from the wonderful harmonies of The Platters and The Everly Brothers to the biggest hits of Elvis and Buddy Holly... and all the giant hits of this golden age in rock history. The Motown sounds of The Temptations, Aretha Franklin, The Supremes and all the great soul hits of the decade are played right next to the fun filled Beach Boys music and rock's legendary Beatles and Rolling Stones. A rich variety of superstars that will stir you on to the dance floor... master of the guitar Eric Clapton, the space cowboy Steve Miller, the grand Elton John, Pointer Sisters, Olivia Newton-John and many others. Michael Jackson, Madonna, Paula Abdul, Prince, Janet Jackson... the masters of choreographed dance music from the exciting era of techno-pop music plus rock's mega stars Phil Collins, Hall & Oates, Whitney Houston, Richard Marx and the list goes on. Pump up the jam or rap with MC Hammer... decade is now and the sounds are hot! From the sweet sounds of Mariah Carey to En Vogue, we have it all! The 70's music of a thousand discos comes alive as the great dance hits are presented from such artists as the Bee Gees, Donna Summer and the Village People. The resurgence of American Country is ever popular on the dance floor. Line dance to the current favorites of Brooks & Dunn or slow dance to Vince Gill and Garth Brooks... Or be swept back to the traditional music of Hank Williams & Patsy Cline. The spice of the dance... who in Wisconsin doesn't polka! Even the faint of heart will participate when it comes to the Electric Slide, Bunny Hop & Chicken Dance. Any dance of your desire... waltz, two-step, schottische!. The sounds of the 40's flood the dance floor with the all time great hits of the Dorseys, Glen Miller, Duke Ellington and the standards of the great singers like the Mills Brothers, Frank Sinatra & Nat King Cole. The action is on the dance floor and the fun is happening now with your current popular radio requests. A constantly expanding repertoire to stay in sync with today's Top 40 music including your requests for rap & alternative rock. ...that meets your expectations and beyond. 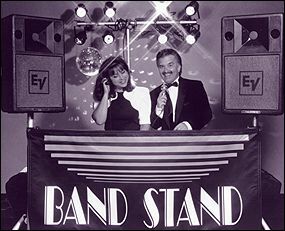 Whether intimate background music, high energy dance or a perfect blend of variety Milwaukee Bandstand can deliver your idea of an exceptional evening of music, fun and dance for everyone. The selection of your DJ should be your first concern when choosing a service. You are invited to speak with or meet your DJ prior to booking and for planning your dance, music and activities. Your ideas & requests are carefully fulfilled and planning is easy with our exclusive wedding, music and event planners. packed with music, fun & games. Extra hours of background music available for cocktail and dinner hours. A colorful blend of sound activated dance lights, par 36 flood cans, a laser effect sparkle light and mini strobe. DJ activated fog and a dazzling mirror ball with pin light beam. Select from a complete variety of music from all the decades and musical styles. Professional equipment generates a great sound in any size room at any volume. is carried to every show as a preventative measure to insure a flawless performance. with logo backdrop and black screens produce a clean, professional looking show. before your guests arrive for that important wedding or corporate function when every impression counts. continuously played at a desirable volume. Breaks are taken only at your request. Select from over 1,000 song titles, including the top hits from each decade and all the popular music forms. As your Milwaukee Bandstand DJ Nels draws from his personal performance experience and musical background. Beginning in his youth as a drummer in the scout corps, he performed in rock bands throughout his school and college years. Graduating from UW Whitewater in Business and earning a Masters in Counseling and Guidance have given him a unique balance between the music and business worlds. He offers your event his qualifications to entertain, an overall knowledge of the music business and the enjoyment of his work.